This mode of transportation offers a 1.5 mile heritage streetcar line in San Pedro. The route runs south over a former Pacific Electric right-of-way from the World Cruise Center. Intermediate stops include the Port O' Call shopping center. The service operates three days a week (Friday, Saturday and Sunday) with occasional service on other weekdays depending on passenger ship landings. Overnight parking is available and no reservations are required. Most lots are open seven days/week, 24 hours/day. Courtesy shuttles are provided to and from the cruise terminal on scheduled ship days. Shuttles are not wheelchair accessible. Parking rates are $1 each hour for the first 10 hours, with a $12 daily maximum. Cash, Travelers Checks, and Credit Cards are accepted. For more information, call Parking Concepts at 1-800-540-PARK. 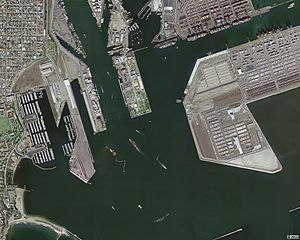 The Port of Los Angeles (also called Los Angeles Harbor and WORLDPORT L.A) is a port complex that occupies 7,500 acres of land and water along 43 mi of waterfront. The port is located on San Pedro Bay in the San Pedro neighborhood of Los Angeles, approximately 20 miles south of downtown LA. The Port of Long Beach is adjacent to the Port of Los Angeles. The two ports compete for business, but cooperate regularly on various areas including security, infrastructure projects and environmental programs. Combined, the number of cargo containers shipped through the two ports rank as the world's sixth busiest port complex. The terminal features two terminal buildings, a 70,000-foot ClearSpan tent structure, three passenger processing areas, expedited U.S. Customs security clearance and baggage handling, secured overnight parking, passenger shuttles. The World Cruise Center is linked to attractions Ports O' Call and the Maritime Museum by a new pedestrian esplanade featuring public art and fountains as well as connections to the Cabrillo Marine Aquarium and other San Pedro attractions when using the Waterfront Red Car trolley/shuttle. Public swimming, boating and fishing, and a vintage Pacific Electric Red Car rail line. Adjacent to Cabrillo Beach Coastal Park and the Port of Los Angeles. The Cabrillo Marine Aquarium is open year-round and operates on a suggested donation of $5 for adults and $1 for children and seniors. The Point Fermin Lighthouse at Fermin Park sits on the southernmost tip of Los Angeles. Built in 1874, the Victorian-style lighthouse is banked upon a 100-foot cliff above the Pacific Ocean. It served as a beacon for the growing Los Angeles harbor until World War II, when the lantern was replaced with a lookout tower. The Lighthouse Museum is open to the public Tuesday through Sunday, from 1 to 4 p.m. Admission is free and donations are welcomed. Entertaining summertime events for the entire family, including the nation's largest Lobster Festival. Within easy walking distance of each other you'll find historical landmarks, parks, museums, one-of-a-kind art galleries, shops and restaurants and unique treasures from yesteryear such as the Warner Grand Theater. A cruise of Los Angeles Harbor provides an excellent waterside view of these kinds of activities at the busiest seaport in America. Whale watching tours are offered during the annual migration of the Pacific gray whale from December to March. For more information, contact the Cabrillo Marine Aquarium at (310) 548-7563 or visit www.cabrilloaq.org.